I'm a visual person and long before I started learning to take photographs I spent a lot of time looking at them. We've all probably seen thousands of images. But once in a while, one jumps out at me and I NEED to understand it. I keep looking at it. I go back to it. I study it. And I find out who took it and how they did it. It's part of my learning so that in some small way I can take another baby step to improving my own work. I can't go to photography school so this is how I learn. And like I do with jazz music, I break it down and figure it out and then try and emulate it. Not copy - but learn and adapt my own style. Lately I've been fascinated with portraits. Here's one that grabbed me a week ago. 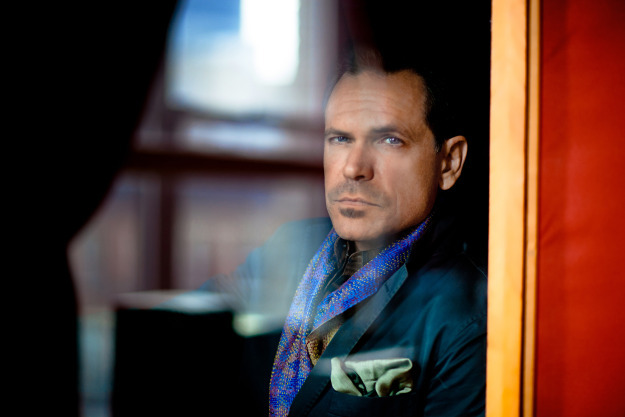 It's the cover for the recently released CD by grammy award winning jazz singer Kurt Elling. It was taken by Anna Webber, my latest photographer who inspires. Now I've been listening to Kurt Elling for years now. Travelled to Chicago twice to see him in person at the Green Mill and a third time in a Four Brothers gig with Kevin Mahogany, Jon Hendricks and Mark Murphy. Once to NYC when he sang with Nancy King at the Allen Room and another time for a gig at Birdland. Seen him in Toronto and a few times in Vancouver. Even interviewed him about creative collaboration for my masters thesis (he's worked with jazz pianist Laurence Hobgood for 18 years). But it's not just the familiarity that drew me to this new portrait. It's the weariness - the tired look in his eyes. This is a singer who has has a very stylised persona, a singer who is in control, yet Anna was able to get behind that image. Able to create a sense of spontaneity and freshness in what is obviously not a candid shot. It's the jewel tones. I KNOW that the washed out, polaroid-y, instagram-y look is in style right now. You see it in food photography and you see it in portraits and landscapes. But I'm still drawn to the moodiness and the darkness in this style. Out of step? Perhaps. I mean me of course. So who IS Anna Webber? She's only 26 (feeling like you've gotten nowhere in YOUR career yet?). A drummer who studied with Walfredo Reyes, Jr., current drummer for Santana, she comes by both talents honestly as her father is both a percussionist AND a cinematographer. Studied under British rock photographer Jill Furmanovsky at 18. In 2006 apprenticed with Baron Wolman, the first photography editor for Rolling Stone. Let's see more of her work. She does behind the scenes candids, album covers and concert shots. Don't you feel like you are right there? That you are peeking into a private moment? How many times has this composition been used - the musicians lined up in a row - yet it feels new. Backlit late in the day with long shadows. The buildings on the right closer to you the viewer than the ones on the left. An offcenter feel. The brick sidewalk coming from the back right, looping around the front and drawing your eye out to the rear left. With my beginner's eye I probably would have shrunk the space between them. That's why I'm a beginner. The slight tilt to the left is a bit uncomfortable - in a good way. I like the saxaphonist placed in the middle of the shot. A deliberately composed shot. It was taken outdoors and manipulated to achieve this look. More of those jewel tones. And most of all, these are NOT professional models - Webber composed this shot with the band musicians. I have a short video below that shows how this was taken. Musicians by nature are great performers on stage, but they are not models...[I] hand them a guitar or give them something to focus. It helps to get them to concentrate on something else rather than being self conscious or shy with a camera and bright lights in their faces. ...shooting live is a whole different ball game - it's 100% reactive. You're just trying to get interesting shots that are in focus, well-lit, at an interesting angle. It's a new riddle to solve when you have parameters. Creatively nailing a shot is part of the rush...Shooting under pressure is fun for me. I know that I'll be trying out a few things that I've learned. I'll play around with composition - get away from such a strict interpretation of the rule of thirds. Put people in the middle or near the sides. Leave a big space between two people and see how that turns out. Give myself some parameters and see how well I can work within them. Challenge myself to do some spontaneous shots. Do some "studio" style portraits and come up with some ideas to help the subject relax. Which photographers inspire you lately? What new things are you working on?